I'm always surprised at how little I hear people talk about Wo Hing General Store in the Mission. As the most recent addition of Charles Phan's Asian food empire, you'd think it had immediate street cred––especially in terms of cocktails. For whatever reason, though, Wo Hing isn't nearly as bustling as it should be. 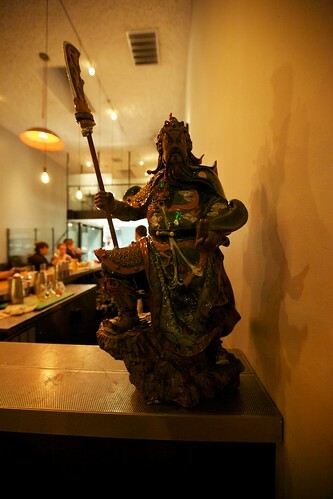 Noelle and I went back last week––admittedly, after Wo Hing's opening six months ago, we haven't made many as treks to the Mission as we used to––and found at that Wo Hing's drinks are just as excellent as we remembered. 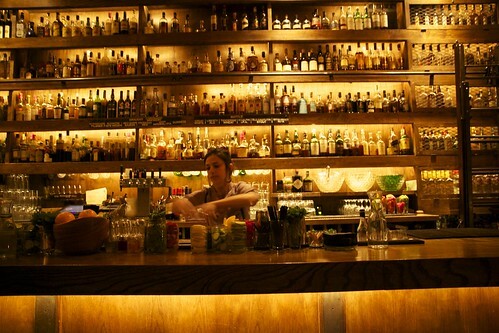 Though the shelf is relatively small compared to many other bars, they are still able to mix and incredible range of cocktails. Recently, John Codd (formerly of 15 Romolo, though he still works there one night a week) took over as bar manager of Wo Hing, and I must say that I like his style. Four of the drinks on the menu are thematic, and they change monthly. This month the theme is "infused spirits." The Currently Available (below) is from that set. 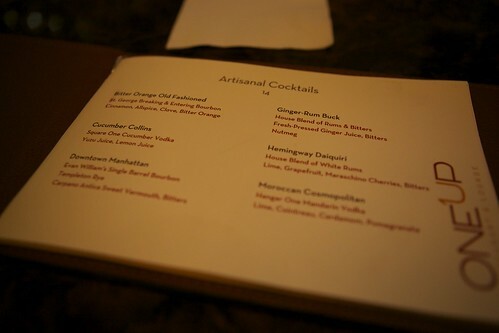 The other, signature drinks are all John's. 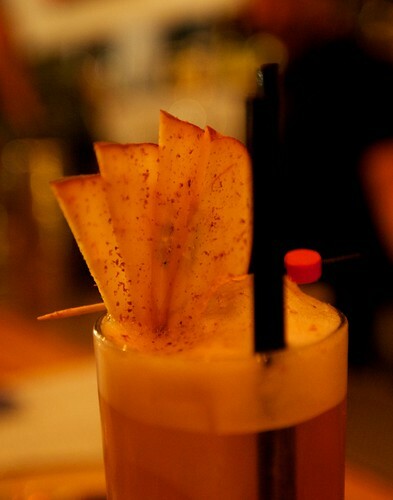 Winter's Cup––homemade Pimms's, rye, congnac, lemon, organic apple juice, maple-cinnamon, and a splash of ginger beer. This aptly named cocktail brings together a cornucopia of fall and winter flavors; the maple and rye work well together, providing the foundation to this drink. 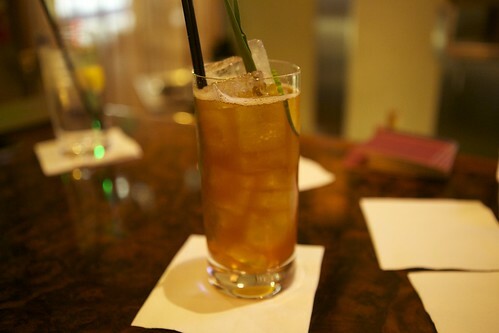 The cognac and apple juice add a nice, fresh sweetness. The cinnamon comes out, accentuated by the beautiful apple garnish. Currently Available––black currant infused scotch, yellow chartreuse, lemon, honey, absinthe. Please go enjoy this drink while it's still available (there's a pun in there somewhere...) because it's part of the rotating menu and will disappear at the end of the month. I loved the heck out of this drink, especially because the absinthe sings on the finish. Rum Cocktail––rum, benedictine, gum syrup, bitters. The benedictine adds nice spice to the rum; this is a nice drink to sip long and slow. You had to know that I was going to work in amaros in a big way into this post somehow. Here it is. This drink was maybe my favorite of the evening (which is saying a whole heck of a lot). John explained that he had to go very light on the fernet for it to work in this drink, offsetting it with a heavy does of averna. The balance is perfect. Even if you're not big into bitter, you can still enjoy the depth and richness of this drink. 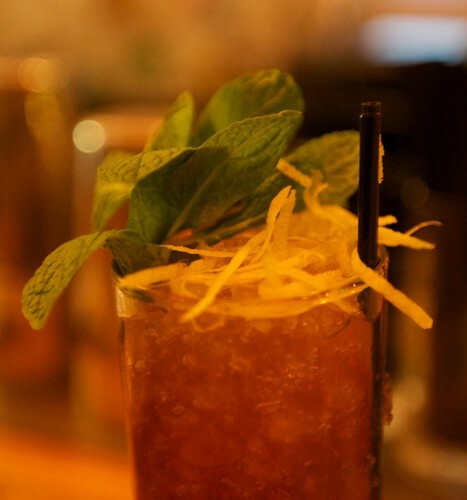 The garnish is both pretty and utilitarian, offering a nice aroma to complement the drink. They also make it appear moody and emo, which is a nice touch. That may just be the settings on my camera, though. Tip: Ask for a "Rum and Oats." It's a hot beer cocktail that's currently off the menu, but will blow your mind. 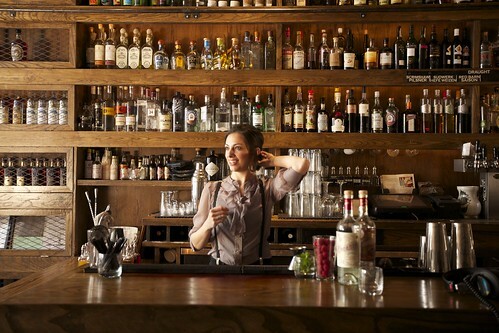 Spotlight on Rickhouse's Victoria George: How to Make a "Panic at the Pisco"
Josh and I are convinced that Victoria George from Rickhouse is one of the city's most elegant bartenders. When we watch her raise her shaker and gently rock the cocktail into existence, there is an uncanny grace to the movement—like a waltz. That's just one reason why we were elated when Victoria asked us to help her make a video for the Campo de Encanto Pisco apprenticeship contest. 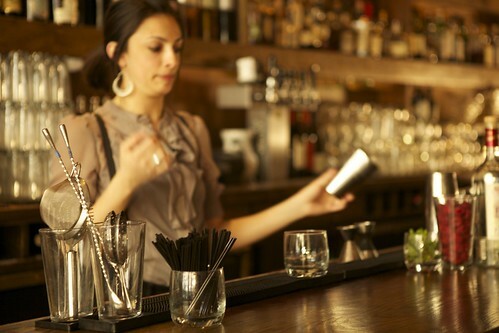 Aside from being a completely delightful person, Victoria posses the winning combination of a finely tuned palate paired with an elegant flair to her bartending. We couldn't wait! The only challenge? We had only a few days to shoot and edit the video. Meet Victoria and learn how to make her drink in the video above (for those with ADD—you know who you are—find a shorter version with just the cocktail recipe here). Watch in 1080p for best results! 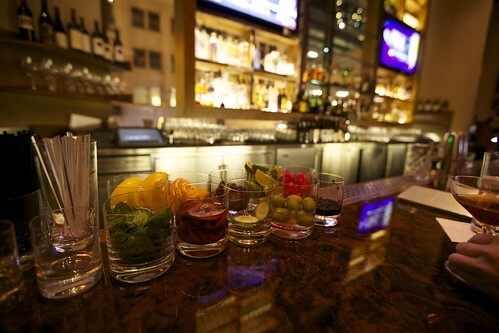 Most San Franciscans don't think of going to hotel bars in Union Square for a fun night out. 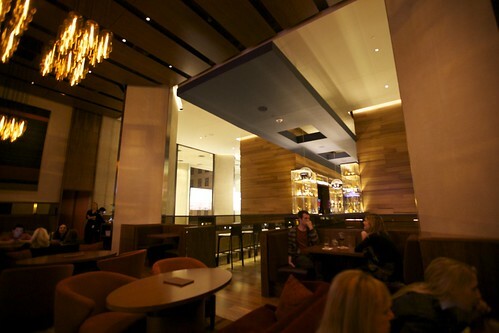 One trip to the Grand Hyatt's newly renovated bar, OneUP, may put hotel bars back on the Friday night docket. 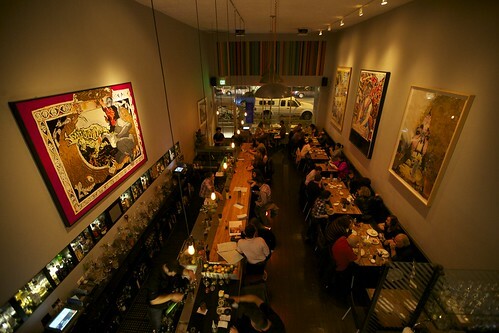 The spacious interior is a perfect home for Scott Beattie's fresh, California style cocktails. Cocktail enthusiasts have held out hope for years, and the event finally happened a few weeks ago: Tanqueray Malacca was re-released into the market. 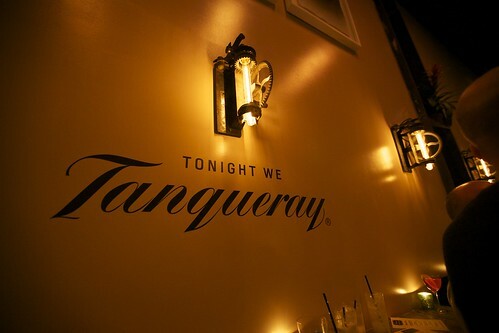 You might recognize the brand Tanqueray as a commonplace gin, known for its green bottles and Christmas-like pine and juniper-forward notes (my grandfather's favorite). 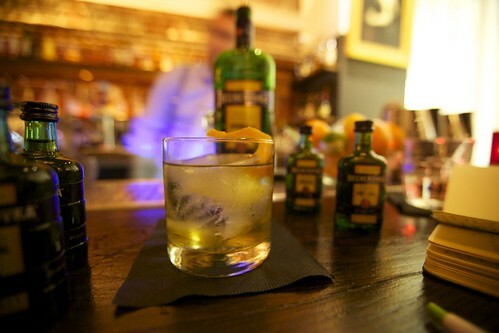 But Tanqueray Malacca—said to be a "wetter" alternative to London dry—is even more fabled and celebrated. 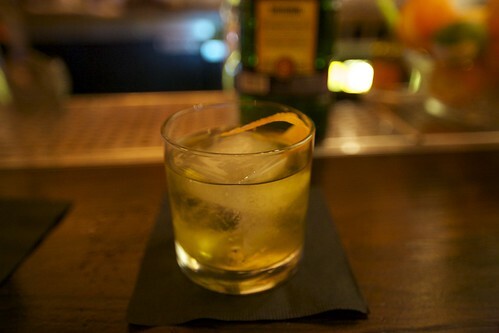 Originally released in 1997, the clean and dry gin was hailed by famous cocktail historian David Wondrich as the closest thing to Old Tom Gin, the old gin recipe used in the 18th century—particularly significant for such early recipes as the Turf Cocktail (equal parts gin and vermouth) and the Tom Collins. However, in 2001, the producers Diageo decided to discontinue the product, and there hasn't been a widely known substitute. Then earlier this year, Diageo announced that it would have a limited re-release of the historical gin in February 2013. Rejoice! About 100,000 bottles are said to be released worldwide on-trade (sold to hotels, restaurants, and bars) as of this month. 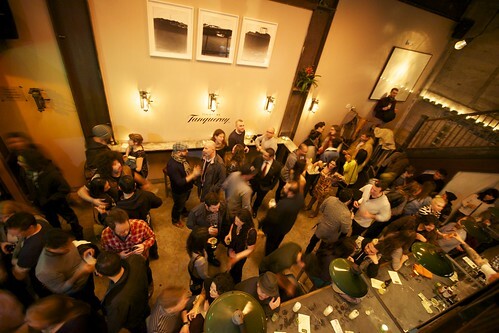 The company held a re-launch party in San Francisco's trendy Trick Dog bar a few weeks ago. Here are some highlights from the event. We did get to try some of the spirit at the event. At 80 proof, Malacca proved to be a very dry, clean tasting gin with a short finish—very easy to drink. The event also featured several Tanqueray cocktails, including three with Malacca. We were lucky to sample two. The Malacca Malacca Fizz was a bright, creamy, and airy drink made with Malacca, pineapple, cream, lime, Suze, cinnamon, egg white, and soda—the perfect drink for the tropics. The Malacca Briars, on the other hand, was a spiritous counterpart, with deep berry notes. It was made from Briars, Malacca, Leopold Blackberry, Duplais Blanche, and salt. Throngs of industry people showed up that night! The bouncer even had to hold people at the door for while because there were too many people inside. According to Diageo's press release, Malacca was re-released into the market in response to industry demand. Needless to say, the bartenders had their hands full all night. Luckily, everyone was pretty chipper. 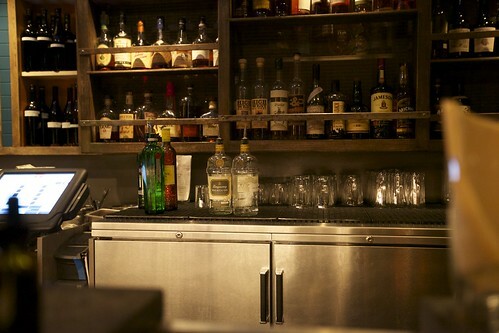 The little reunited family of Tanq 10 and Malacca in action behind the bar (Malacca on the right). If you asked me about beer cocktails yesterday afternoon, I'd tell you to stay the heck away; inevitably, they taste gross and leave you feeling even worse. 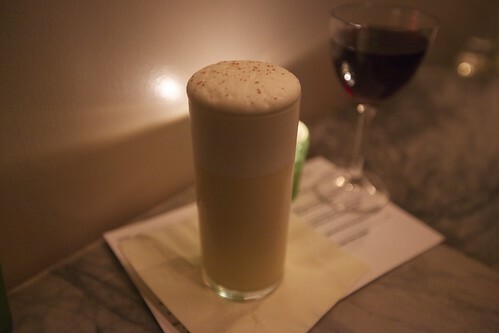 Last night––Valentine's night, coincidentally–– I fell in love with a beer cocktail: the White Persian. 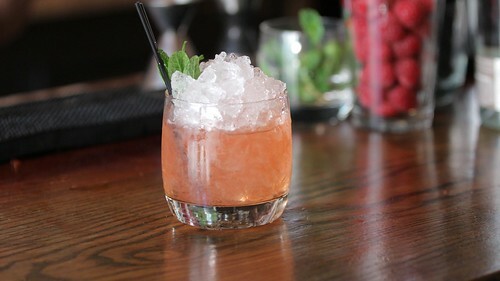 You can try this drink this Sunday night, 2/17, at 15 Romolo's third annual Booze and Brew Brawl. ...and serve in a collins glass over ice. 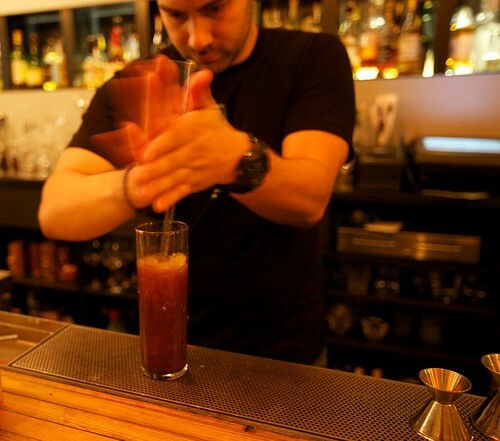 Your first reaction might be, "Holy moly, that drink is way to complicated." On paper, it may look that way. But when the components mix, the result is magical. The moment this drink hits your tongue, you can tell some serious thought went into this combination of ingredients. It isn't surprising that Isaac Shumway, creator of this drink, comes from a cooking background and brought that expertise to this drink. I don't even want to qualify this as a "beer cocktail" because that sounds like a qualifier. This drink is a bona fide cocktail. The tequila and the Belgian White Ale go together perfectly. The ale itself is citrusy and wheaty; the marmalade compliments the ale perfectly, accentuating the citrus. The chamomile orange bitters help to add depth to the drink, pairing with the citrus notes; the chamomile brings out some of the floral notes of the beer. The curry adds a nice spiciness to the drink, complicating the taste enough to make it interesting, but not so much that the drink is gimmicky or overpowered. 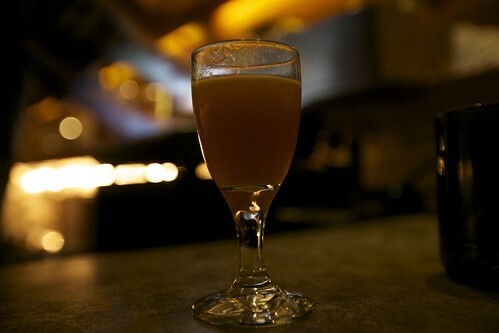 The egg white and marmalade give this drink a beautiful creaminess that only gets better when the beer is added. 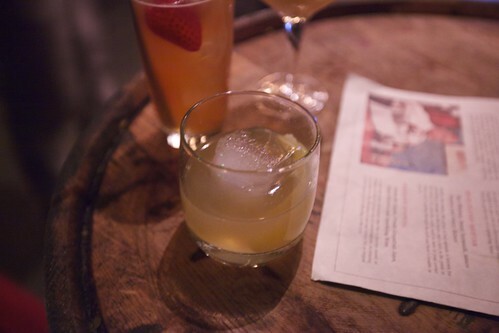 If you're even a little curious about this drink––which you should be, it's awesome!––then don't miss your chance to try it this Sunday night, 2/17, at 15 Romolo's third annual Booze and Brew Brawl. The Booze and Brew Brawl a San Francisco Beer Week event in which local bartenders from places like Heaven's Dog, Maven, Tradition, Fifth Floor, The New Easy combine cocktails and beer (duh). The event is going to be incredible. The tickets (which can be purchased here) may seem a little steep at $35, but keep in mind that you get a welcome cocktail, pub fare, and plenty of samples of each bartender's entry. 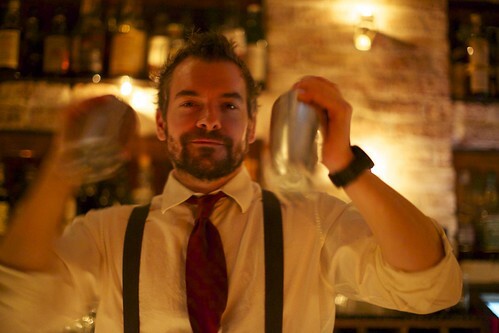 You've probably seen the distinctive bottle on the shelf at BevMo, on some back bar, or perhaps in the hands of SF bartender Russell Davis (above) but could never pronounce it: it's "becker-OV-ka." Becherovka, an amaro, has been produced in the village of Karlovy Vary (aka Carlsbad) in the Czech Republic for over 200 years. 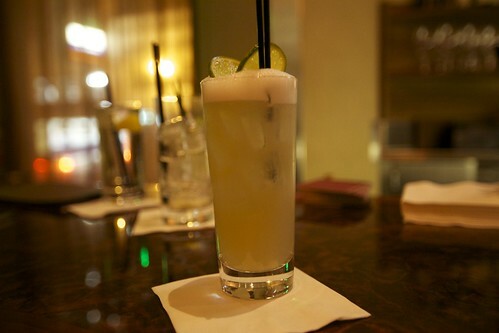 It's making its way onto the cocktail menus all over the city, such as Local Edition and Rickhouse. 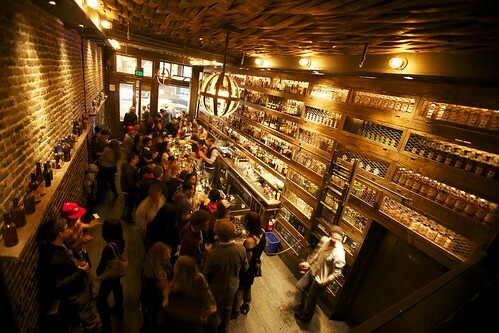 It's also regularly stocked at a huge variety of bars, such as Clock Bar, Cantina, Dave's in SOMA and Bender's in the Mission. The amaro is by far the most drinkable amaro I've had. Anyone can pick up an ice cold glass of this stuff (keep the water content to a minimum, so store it in your freezer) and immediately fall in love. It's not very bitter, but you definitely get a little bit of bite, especially when it's served cold. The flavors I get most are cinnamon and then clove on the finish. There are 38 other spices and herbs in the secret recipe, but only two people in the world know what they all are and in what proportions (seriously). 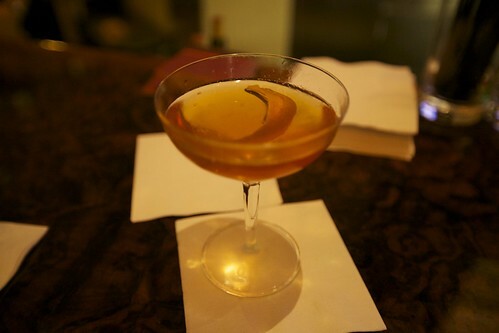 Usually, a Bijou contains gin, vermouth, and chartreuse. This version substitutes the Becherovka for the chartreuse, and it's incredible. 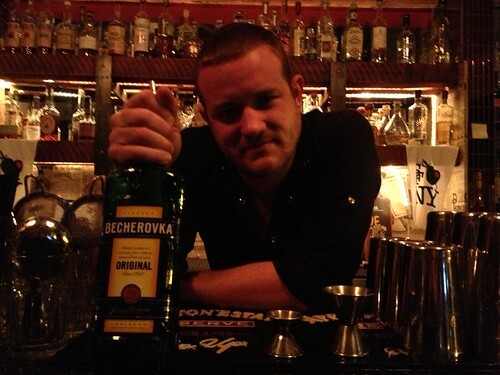 The Becherovka blends perfectly into the cocktail; it doesn't drown out any of the flavors but only enhances them. 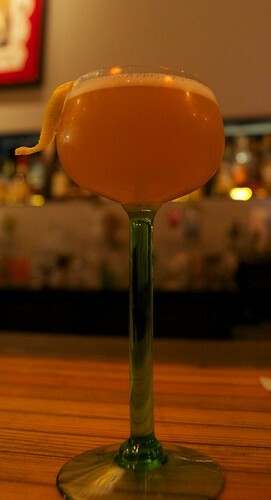 Becherovka citrus cocktail. 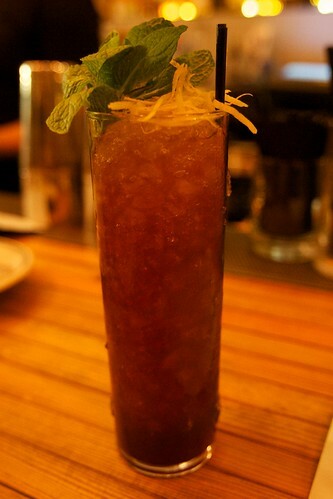 This one is a variant on an Aviation or Last Word, depending how you interpret the recipe. It's got Becherovka, gin, lemon, falernum. 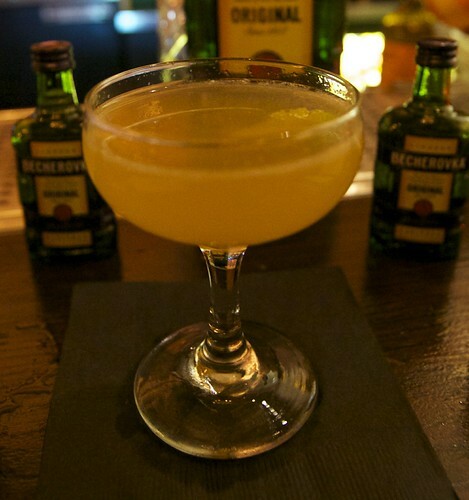 I was pleasantly surprised to see Becherovka work so well in a citrusy drink. 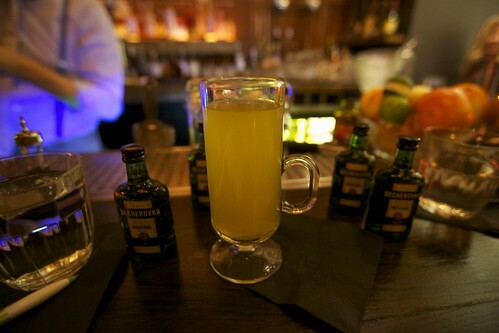 A Hot Toddy with Becherovka is my next winter drink obsession. Its flavor profile makes it super easy, too. 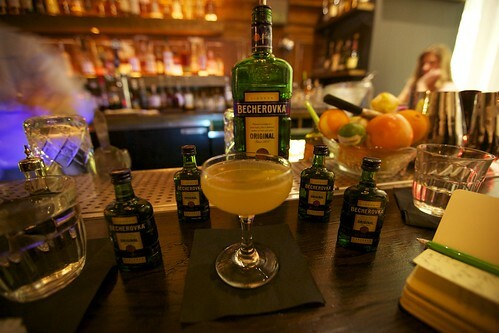 All you need to do is add a bit of lemon and honey to some Becherovka and hot water and you're done. At $24.99, this amaro is substantially cheaper than most amaros we'll review. It's worth buying. I get a little nervous when we have visitors in town, and we have to take them around. I love this city, and the thought of leading our friends to a disappointment bums me out. 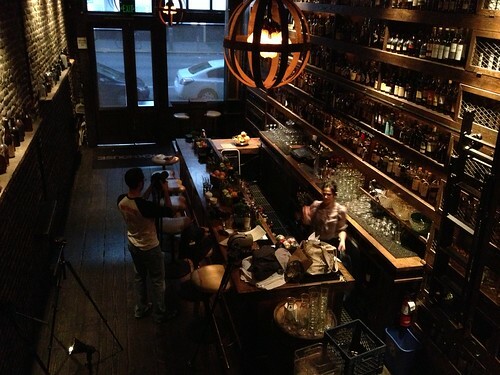 But if you were to ask us about a quintessential San Francisco bar, Rickhouse would definitely make the list: beautiful wood interiors (like the inside of a cask), stunningly tall liquor shelves (so high that they need a rolling ladder), solid cocktails, punch bowls, live music, a good crowd, and not to mention a fireplace. 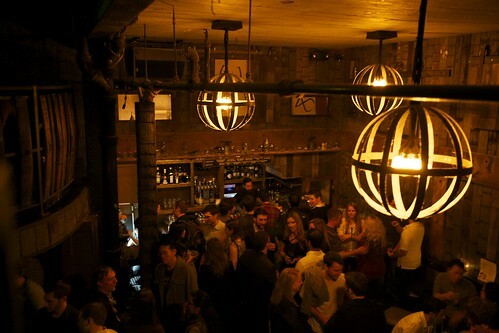 Which is why whenever we have visitors in town, Josh and I inevitably find ourselves at Rickhouse. Good thing there was Rickhouse this past weekend on the glad occasion of hosting Josh's friend Ash. After a satisfying bowl of some of the Bay Area's best hand-pulled noodles (I had to get that in there somehow) and a nap to ward off the happy, post-noodle sleepiness, we all found ourselves once again in the magnificence of Rickhouse. 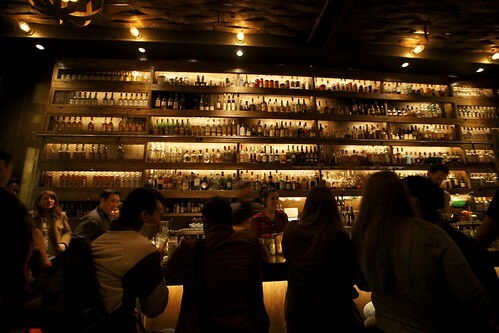 Most weekday evenings, especially Fridays, the bar fills up wall-to-wall with Financial District suits and startup hoodies who are whiling away relieved post-work hours. 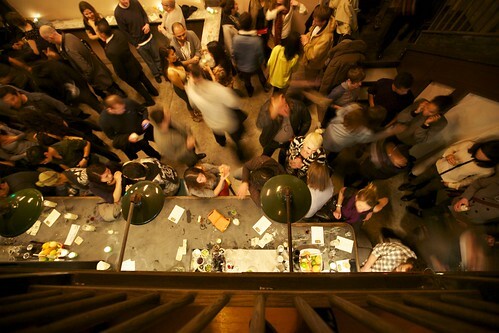 A bluegrass band will set up in the back of the space, near the second well, and enthusiasts can gather around or climb up to the second floor—a modest loft space—and watch the band from above, leaning on the railings and looking down. 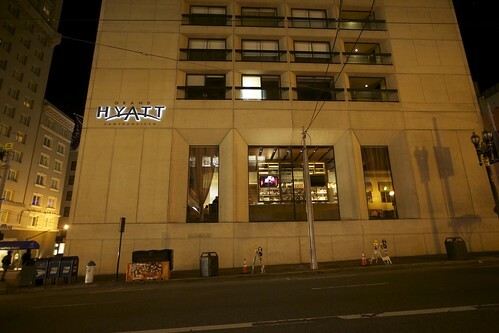 This night was no different, and the bar was crushing it with throngs of people congregating in the bar's dark corners, clutching their drinks with happy abandon. 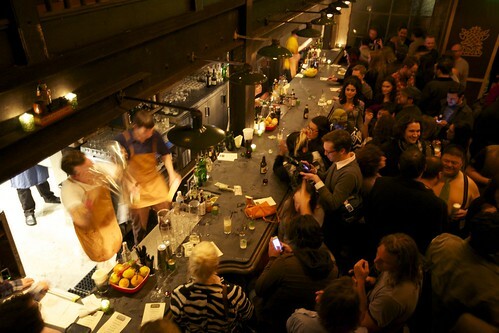 Though you might not know it, Rickhouse is part of an ever-growing empire of watering holes in San Francisco called Future Bars. And it's a good thing. With Bourbon and Branch, Local Edition, Swig, and Tradition among its offspring, Future Bars excels at creating enchanting, innovative, and often elaborate bar atmospheres. 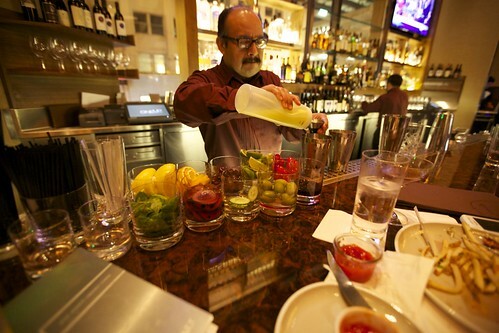 The wells are high volume, and the cocktails are always solid, using great ice and fresh ingredients. We ordered a few drinks. We were especially excited because Victoria was there to mix them with her expert hand. She has one of the best palates in the city! She is amazing. 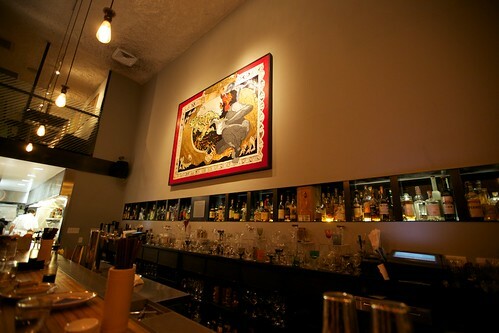 The menu is made mostly of contemporary classics and punch bowls. They used to have a much more extensive book of cocktails as their menu, but I suspect it got too unwieldy. 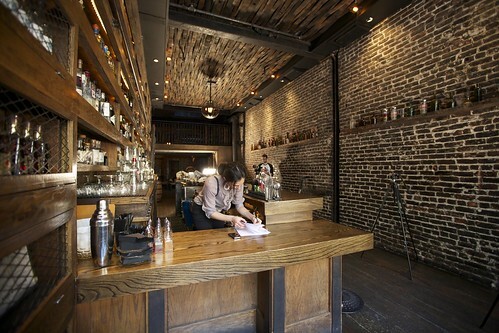 You can still ask for a wide variety of drinks, though, even if it is not on the menu. In one misguided moment of inspiration, for instance, Josh and I felt like we wanted some flips (cocktails with a whole egg, including the yolk) and sat at the back bar on a quiet weekday night. We got three between the two of us and promptly got stomachaches from the overindulgence in yolks—but we were happy that we could even order it. Josh got an Old Cuban, which is a bright, sparkling, refreshing drink made from aged rum, fresh mint, fresh lime juice, cane sugar, bitters (often angostura), and sparkling wine. It's great for a summer's day (or when you wish it were a summer's day) and seems impossible not to like, so it's accessible for a wide range of drinkers. A contemporary classic first mixed by Audrey Sanders, the cocktail was one of our first favorites at Rickhouse (introduced to us by Trevor Easter, if I'm not mistaken). Meanwhile, I ordered a Nemean Cup—a citrusy cocktail made warm and viscous by apple brandy and wildflower honey, served over a large cube of ice. 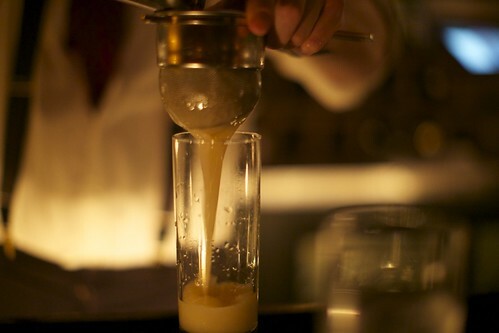 In addition to the apple brandy and wildflower honey, fresh lemon juice and celery bitters are used to make this drink. Think about the 3.0 version of lemon tea. And the great news? Ashley loved the place! The full Flickr set here. 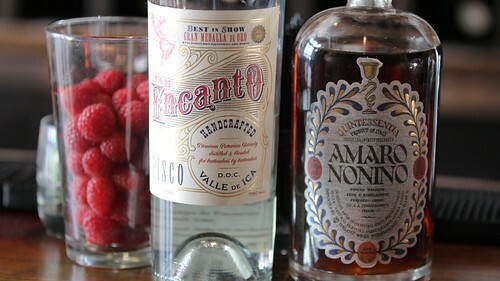 Amaros––literally "bitters"––have been experiencing an American renaissance recently. Although the U.S. is still far behind Europe, there are more and more amaros available on American shelves and the average cocktail nerd is pretty well used to the bittersweet goodness that Europeans have been enjoying for centuries. In this series of posts, I'll point out a few amaros that you have probably seen around but haven't had the pleasure of trying. I'll also make my stance known right now: every amaro that I put up in this series is incredible, and I think you should try them all. If I didn't like an amaro, it won't appear on this blog. 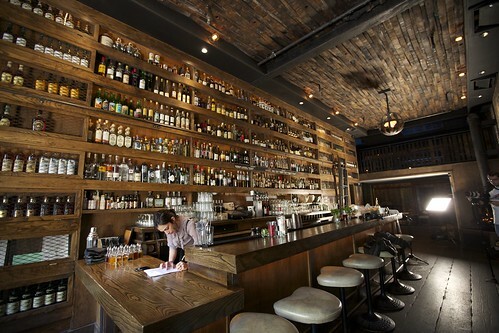 Most of them can be found at the following spots in San Francisco: AQ, Bar Agricole, Locanda, and Lolinda. Today's amaros are more challenging than some others you see about town. 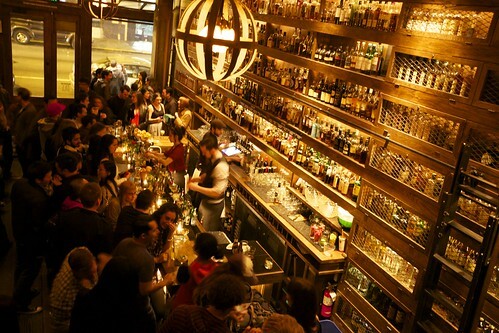 If you don't live in a cocktail metropolis, you may have to do some digging to find them––it's well worth it. 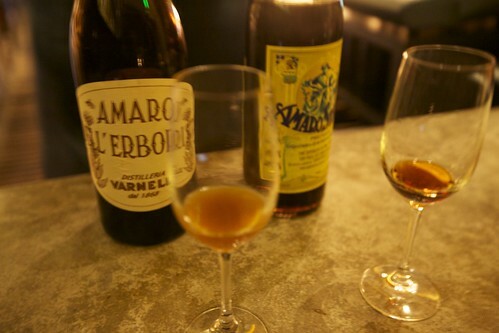 Amaro Dell'Erborista, on the left, is among the bitterest amaros we'll cover in this series. Dell'Erborista means "the Herbalist." It comes from the distiller's grandfather's recipe. He was the herbalist in town. T As soon as it hits your tongue it fills your mouth with celery or bitter greens-like bitterness. Once you get past that (if you can), though, you taste deep, rich honeycomb. It's unfiltered and uncolored. If you don't have a palette for bitter yet, then I don't think you should invest in a bottle, not by a long shot, but definitely give it a taste. 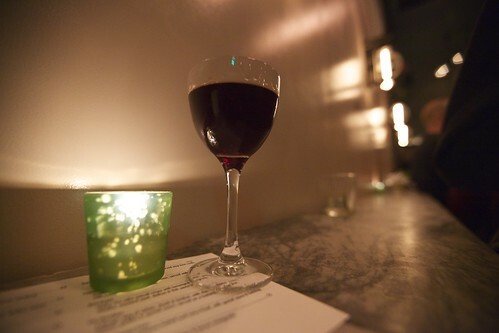 I've found it over at Lolinda, Locanda, and Bar Agricole. 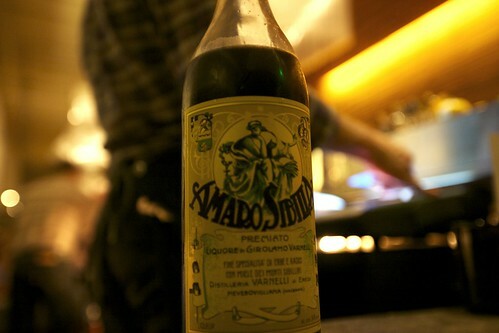 Amaro Sibilla is made by the Herbalist's granddaughters. It's only been available in the States for about two years. The Sibilla is substantially less bitter than Dell'Erborista, with a brighter honey flavor throughout. Sibilla is distilled only with honey, affecting the flavor and the viscosity. You can buy it at Cask in San Francisco or at their online store. 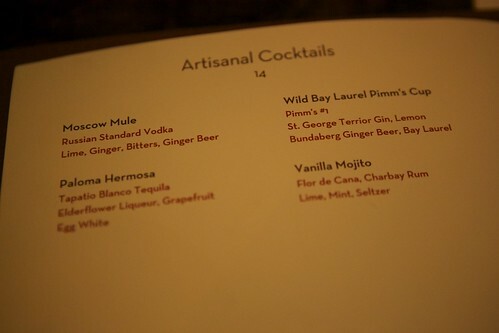 If you're lucky enough to be at a bar that has any of this, try an Amaro Cocktail. 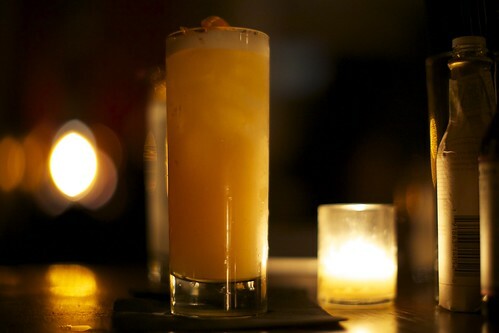 It's a delicious cocktail with a lower ABV––a good drink on nights you want to take it easy. 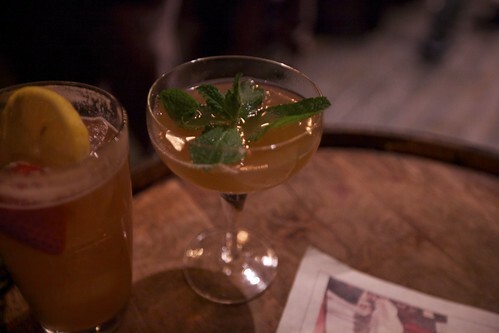 It's relatively simple: Amaro, orgeat, lemon, and bitters. 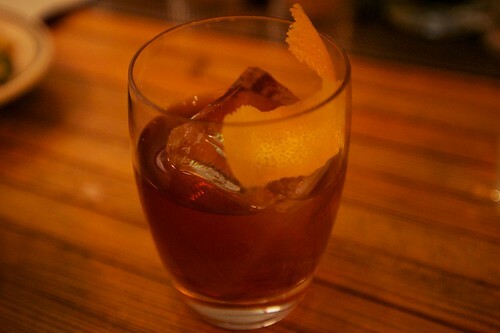 The amaro lends a nice complexity and richness to the drink.